Ha ha, I know. Think the LS138 is going to have to go. I think so too, you don't need it now you have the Navigator!! I must say I'm impressed with your recent impulsive buying! As for this guitar, super is rare. Why the Bigsby Dave? I've never understood the appeal of those things, & they add a fair bit of extra weight too. Hi Mike, I bought this one a lot on looks and the Bacchus reputation. I think it looks great with the bigsby - sort of more retro. I must admit I don't use whammy bars much anyway but we'll see when it arrives. Mike, you got me thinking about the bigsby but the concensus seems to be that it improves the tone as well as looking really cool. Each to their own Dave - we have very different tastes in guitars! 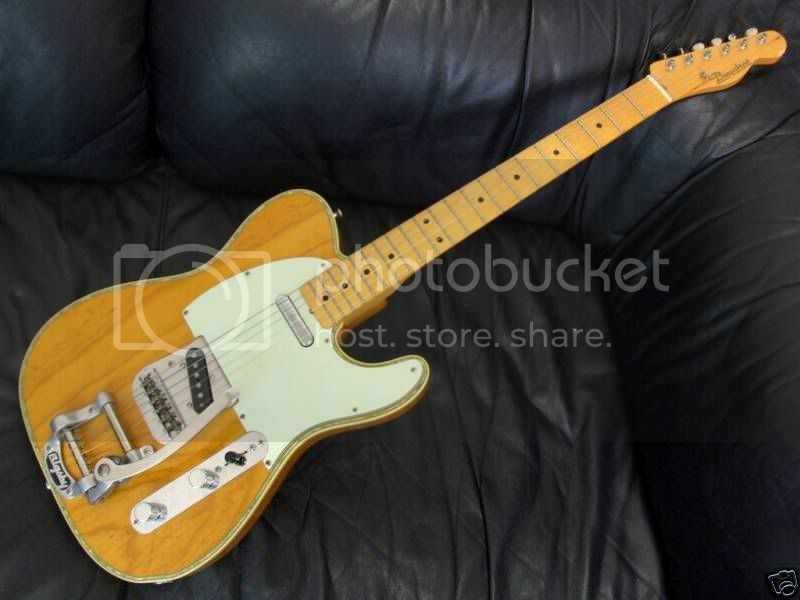 Personally I think they ruin the clean, simple lines of a Tele. I have a Bigsby on my 330, & it seems much less use than a Strat trem - less range, awkward to use, tuning problems etc. But then I'm not a trem fan at all, they're screwed down on my Strats, so I'm biased, as usual.